The local author of How Does It Feel: Elvis Presley, The Beatles, Bob Dylan, and the Philosophy of Rock and Roll takes us through his musical and mediative journey. My family moved from Northern California to Nashville when I was thirteen. I went to high school with future musical luminaries like Shooter Jennings (Waylon’s son), William Tyler (guitar virtuoso and co-owner of the Stone Fox), and Sam Smith (drummer for Ben Folds and others). William and I shared an obsession with British music from the sixties, and he and Sam, who were in a great band called Lifeboy, were kind enough to play with me on my first recording when I was seventeen. I went to college in Austin, where I played in an Elephant 6 related band called The Arthurs, who opened for My Morning Jacket, The Shins, and Of Montreal. After college, I moved to New York City, where I became the singer-songwriter for The Morning Pages and started a PhD program. At the same time that I was reading and writing about thinkers like William James, Alfred North Whitehead, and Henri Bergson, my band was gaining momentum, and I sang on stages with members of The Black Keys, The Strokes, Dr. Dog, Midlake, and Bob Dylan’s Rolling Thunder Revue band, as well as singers like Sean Lennon, Norah Jones, Adam Green, and Nicole Atkins. The Pierces, who made a few albums in Nashville before we met them in New York, sang harmonies on our record, Rising Rain, which was produced by Russell Simins of the Jon Spencer Blues Explosion. My energies had long been divided between my musical and academic endeavors, and when it came time to start my dissertation, I decided to combine my two primary interests to write about philosophy in relation to rock and roll, particularly the early careers of Elvis Presley, The Beatles, and Bob Dylan. During all of this, I got married, and we had a son and decided to move back to Tennessee so I could focus on finishing the dissertation. We lived in a cabin in the Smoky Mountains outside of Gatlinburg for a year, where I wrote the majority of what would become How Does It Feel? It was a pretty drastic change after living in New York for nearly a decade and, although it was a great place to get some writing done, looking from my office window at the river below, we soon found ourselves yearning for city life. We moved to the Lockeland Springs neighborhood of East Nashville in 2011, and we feel like we’re home. Because I had been an aspiring rock star for about fifteen years before shifting my full attention to writing, my focus had been on understanding the way artists like Presley, Lennon, and Dylan thought in order to create their music. I found that a number of related streams of philosophical, psychological, and sociological thought, from Hegel and Nietzsche to Max Weber and C.G. Jung, seemed to provide a vocabulary for articulating the significance of rock and roll in the context of what philosopher Richard Tarnas refers to as “the evolution of world views.” The crux of this evolution turned on the transition from premodern archetypal, alchemical, shamanic, and teleological modes of thought, which were predominant prior to the seventeenth century, to the individuation of the modern intellect through science and rationalist philosophy, accompanied by Weberian “disenchantment.” Drawing on concepts from all of these thinkers, the book suggests that rock and roll mediated the integration of ways of knowing characteristic of premodernity with predominantly modern epistemologies. If this all sounds a little dry, I should emphasize that I tried very hard to avoid imposing a preconceived theoretical framework onto the text of rock and roll. 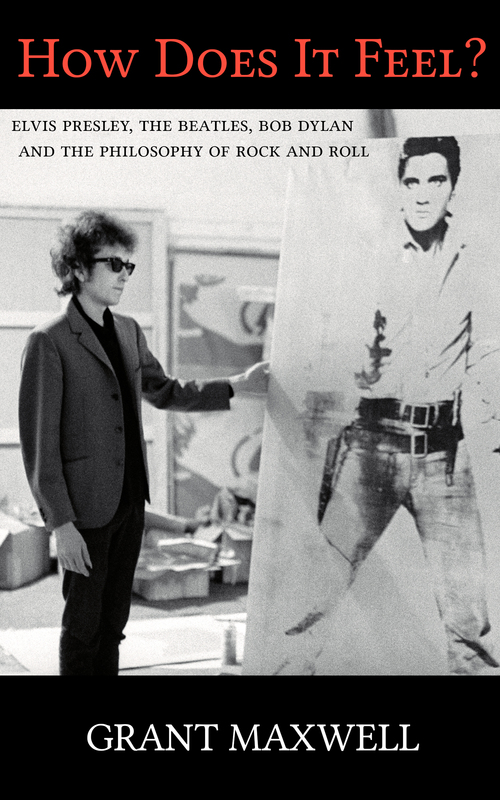 Rather, the book offers a philosophically informed retelling of the familiar narratives of Elvis’ epochal recordings at Sun Studio and the ensuing mania, the Beatles’ primal Hamburg initiation and their reconciliation of this mode with the technological sophistication of Abbey Road Studios, and Dylan’s pilgrimage to New York, his rise to fame as the “Crown Prince” of folk music, and his dramatic transformation of rock and roll in the mid-sixties, all driven by what he termed his “extreme sense of destiny.” The book suggests that these musicians performed the vanguard of a cultural trajectory stretching back to the Copernican heliocentric revolution in the sixteenth century, back to the heart of the “Axial Age” in the sixth century BCE, and even back to the Promethean discoveries of fire, language, and ecstatic religious activity. The book came out about a month ago, and I’m very pleased to report that it has consistently been on the Amazon bestseller lists for Presley, the Beatles, and Dylan in both the U.S. and the U.K., even sometimes topping these lists along with Dylan’s Chronicles: Volume One, The Beatles Anthology book, and Nashville’s own Peter Guralnick’s Last Train to Memphis: The Rise of Elvis Presley. The response thus far has exceeded my expectations, and I’m really grateful to everyone who has read the book and given their support in some way, including our incredible community here in East Nashville. I drive an ’89 red and white Ford Bronco, I run a lot in Shelby Park, and we eat at Rosepepper on a bi-weekly basis, so feel free to say “hi.” I promise I won’t talk about epistemology unless you really want me to. Here’s a link to the book’s prologue, which posits a new theory of what really happened when Bob Dylan “went electric” at the Newport Folk Festival in 1965.